The Portable Football Holder with a New Innovative One-Piece Design! Now purchase two at discounted rate and pay shipping for only one item. Adjusting levers hold any size football for block or ground placement kicks. The Portable Football Holder with a New Innovative One-Piece Design! Durable and light-weight. Adjusts for block or ground placements. Great for individual practice and sideline warm-up with kicking net during games. Adjusting levers hold any size football. The Portable Football Holder with a New Innovative One-Piece Design! Durable and light-weight. 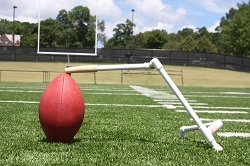 Adjusts for block or ground placements when kicking extra points and field goals. Great for individual practice and sideline warm-up with kicking net during games.